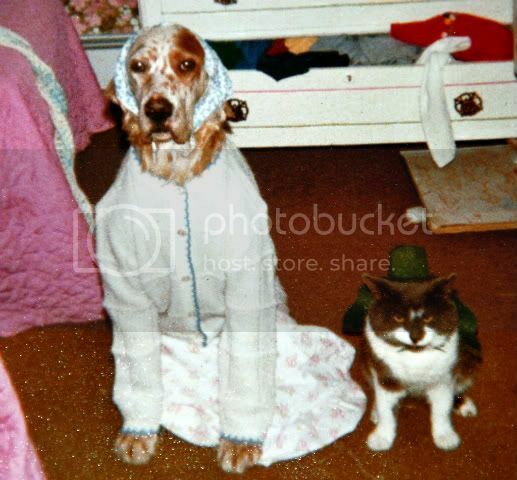 so I was going through old photo's and found these of my childhood pets. These are pictures of pictures---so again, not the best quality. But they made me smile. And they are OLD pics--look at the haircut, and clothes! 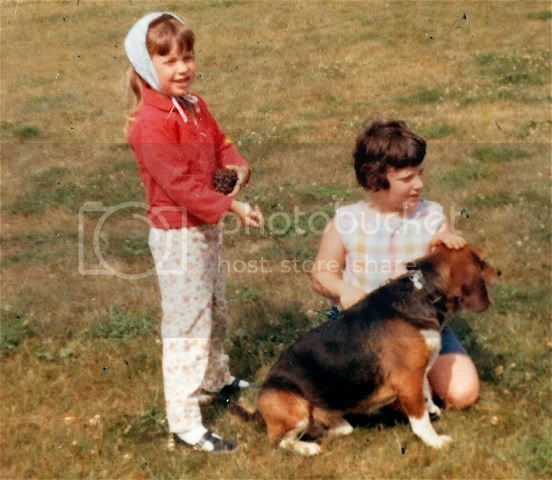 First, this is my beagle (look at the size of him) Bulldozer--I think he is why I was so drawn to Wilson. that's all--just thought I'd share my trip down memory lane! That last pic does look a lot like Victor! Wow! 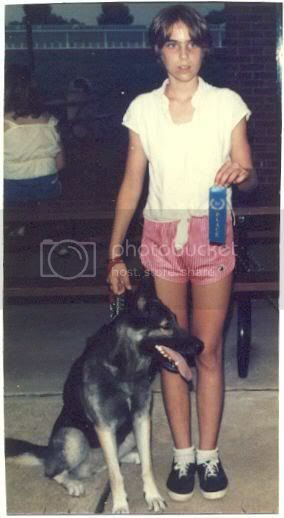 Here's me 12 years old with Misty. We won a ribbon for best team player. 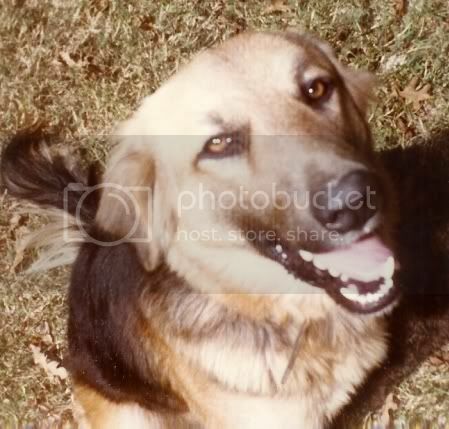 here is my first childhood dog. So a great girl, put up with a baby and never steped a foot wrong. her name was CJ, her old owners took her to the vets to be PTS. Luckily my family 's vet called them seeing as they put down their poodle a few weeks ago, and asked if they would take her, so glad they did. (got to love the crappy old blue nasty wall papper. Got her when I was 4. 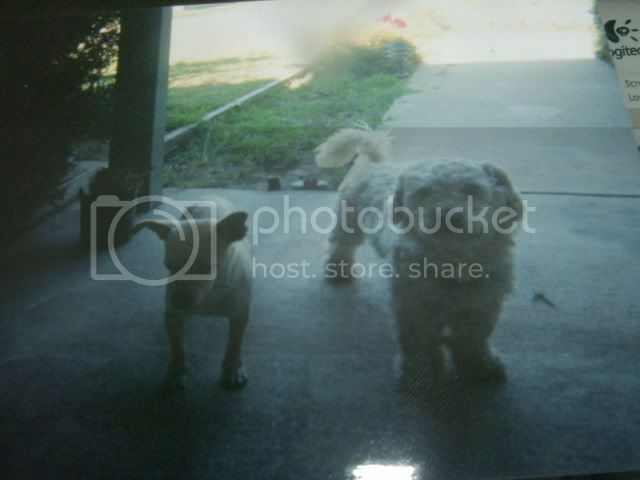 After Cj died, we got another poodle that year. When asked what I wanted to name her "CJ" is what I said, so she became CJ the second. And being is how my family is irresponsible with pets, CJ had 3 litters all by accident before being finally fixed. 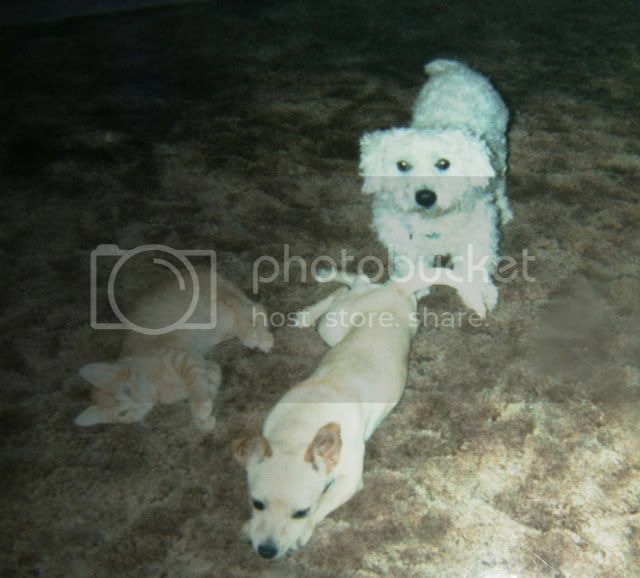 What came of the first litter was Sweetie, half poodle half chihuahuah (however you spell it lol) in 1992. So thats it for childhood dogs. If I ever had a extra 30 hours in a day I could post all my other child hood pets. but with having over 20 pet rabbits, numerous small animals (hamsters, rats ect) frogs, iguanas, anoles, long tailed lizards, birds and turtles, it would take forever to post them all. this thread is so cute! Gah, I will have to find my pictures! So for now, descriptions! 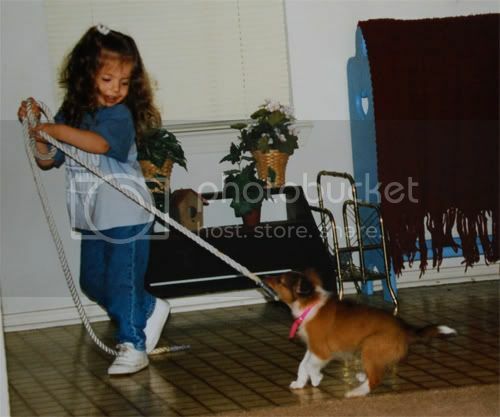 My first dog ever was a Toy Poodle named Joey. He wasn't too fond of us children, but hey he was here before us!! He was killed at 13 years old by a stray husky we had found. (This was about 10 years ago). 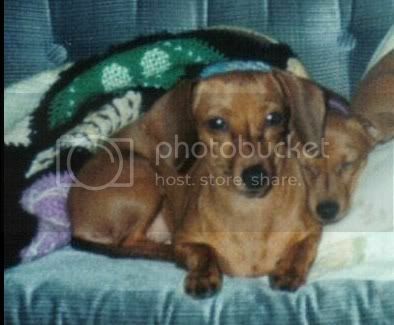 Then we got Hannah (standard dachshund) when I was 2, and that is when my mom got hooked. (She had them growing up, but like I say she said she wanted to try something else...but ended up going back to dachshunds lol). I also had Syrian hamsters since I was about 5, and I will probably always have a Syrian hamster. I got my first rats at 14. Here's Misty, my parents got her before I was born. She was born in their carport in Missouri, she was a singleton kitten. We also had a black cat named Franco who my parents got when they bought a pool table - it was a package deal. I don't have a pic of him on here though. And this is Coco, the Chessie I always talk about being aggressive. 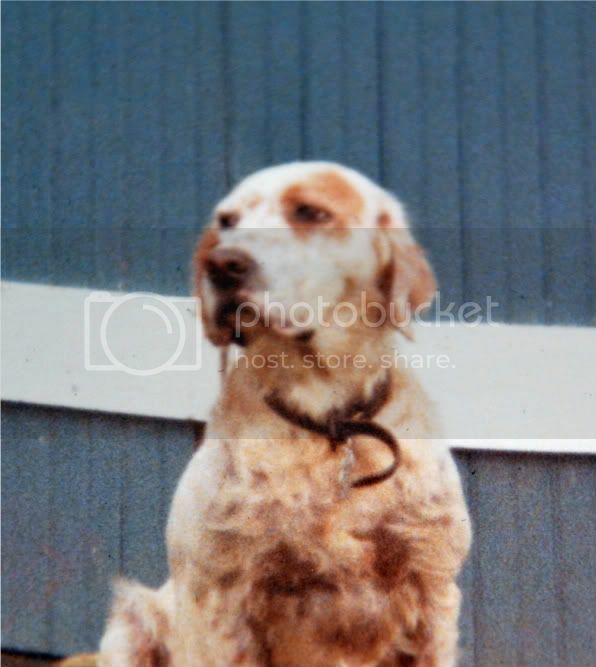 I don't have a pic scanned in of him young, he was 13 in this pic. 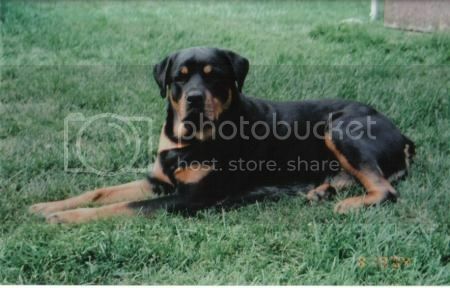 Sabi, our first Rottweiler. Dad found him in a newspaper ad when he was about a year old. 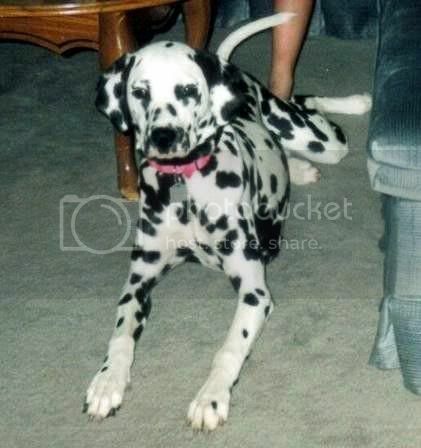 Sky, our Dalmatian. A friend's mother got her kids a Dal, didn't research the breed, and she was offered to us. Jesse, our Dachshund. Given to us by a vacuum salesman. He came to our door, wanted my dad to buy a vacuum, and offered him his wife's "stupid, misbehaved dog". My dad felt bad for her, and bought her right then and there. She was neglected and abused, and lived in the basement all by herself. It took a really long time to gain her trust, but she turned out to be a fantastic dog. 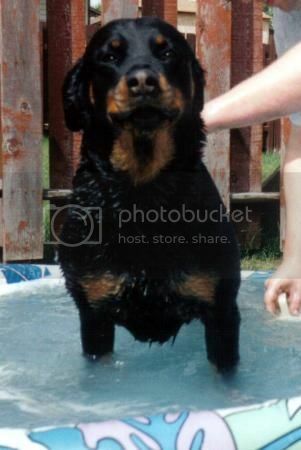 Bianca, our second Rottweiler. Had health issues and minor conformation faults, so her breeder was rehoming her. 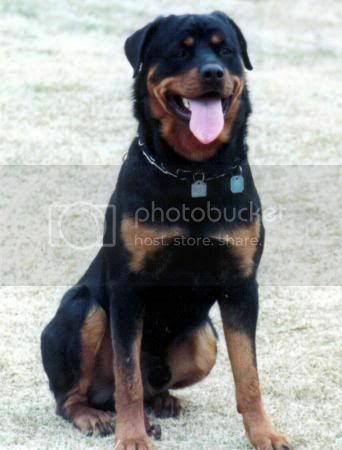 Echo, our third Rottweiler. Had to be PTS in 2005, at the age of 5yrs old for Megaesophagus and cancer. I know I have a better picture of Jesse somewhere, but I can't find it at the moment. We also had Tuffy, a Bichon Frise, but I don't have any pictures of him on the computer. I grew up with Borders.... my parents had Boxers when I was really little; one growled at me and was rehomed and the other was put to sleep when her cancer made it hard for her to breathe. My mom had a black and tan tortie kitty when I was little.... then there were a string of other kitties.... Abby was our first BC... we lived in the country- she fell off the back of a pickup (broke a rib, punctured a lung and broke her jaw but recieved vet care and lived), got shot through the neck by a neighbor who didn't want her help with his sheep and lived, ripped her belly open clearing a barbed wire fence and lived.... she eventually died cause she got hit by a truck... her daughter was poisoned by another neighbor for barking.... and then we moved out of the town due to sadistic people. 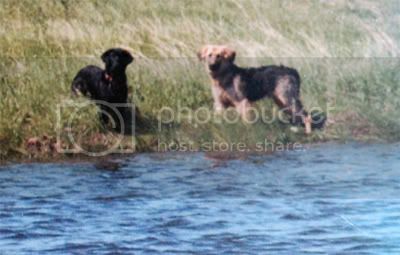 Then we had Lou and her pups (2 litters) and Dez- one of Abby's pups that came back to us because her owner couldn't keep her in the back yard and hadn't bothered to spay her so she had had several aborted pregnancies from random unknown dogs... I felt bad for her. Lots of Borders.... I'll see if I can scan and put pics up. Neat thread !! Wish I could add ! 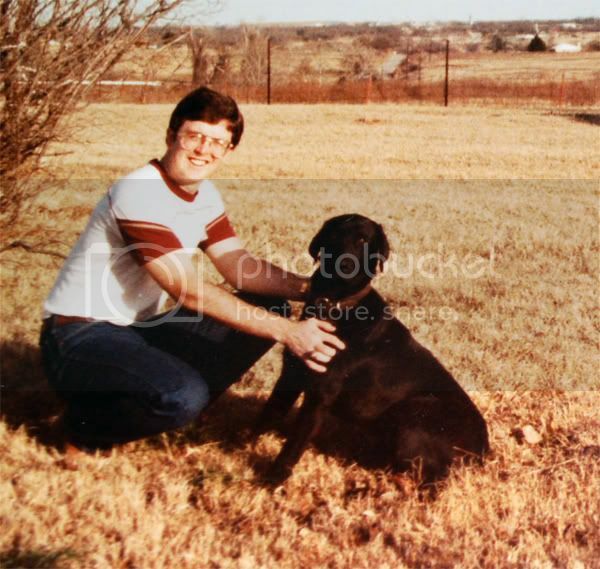 I don't have any photos but my first pet ever was a black cat named Percy... all I remember of him was being out in front of the house trying to feed him grapes and french fries. I've owned a pit bull mix? [not as dog savvy as I am now so its just a guess], a pom,,,,I don't know how to spell the names for these two, weird names my mom came up with. Munchy...cocker spaniel? Those are my little legs lol. Here's two of mine. Pete has never been see online, I don't hink. I finally found a pic where he doesn't look like a black blob. 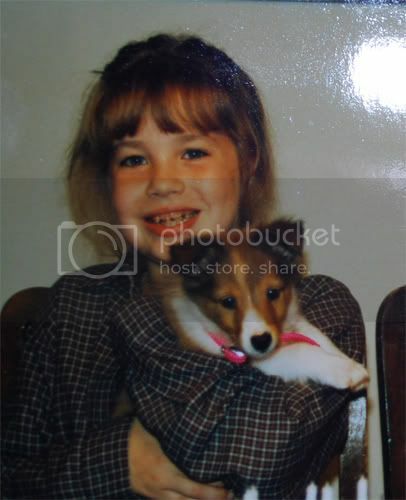 (We had bad cameras back then) I WILL dig up a picture of Rosie too. Rofl. 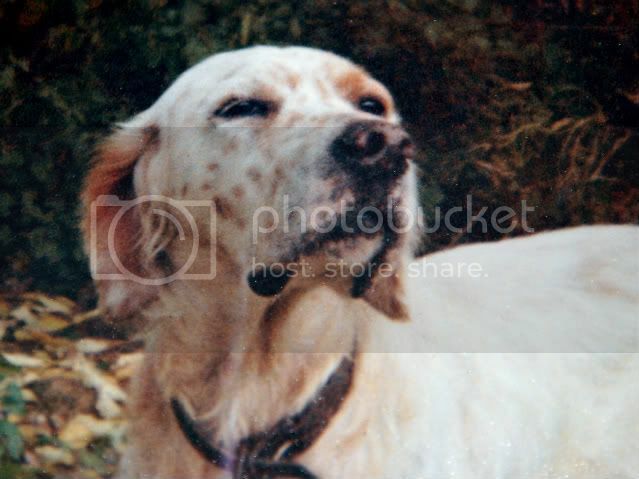 Pete was a gundog and Shack thought he was a gundog. And Just Shack. I adored Shack so much. 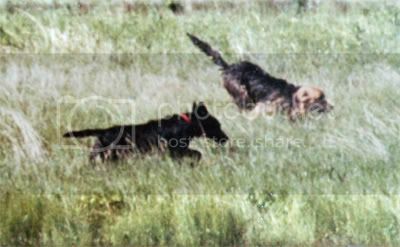 I want a pure GSD someday. Rosie, my first dog ever. 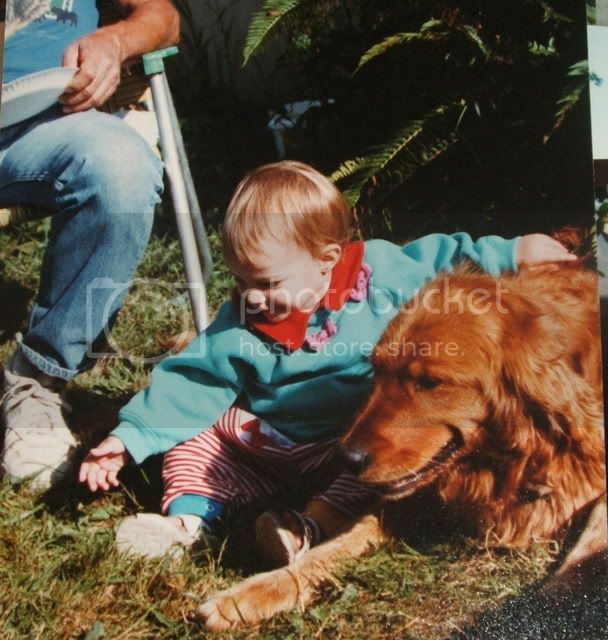 Our old Golden Retriever, Tuffy, with my little sister. My parents got him from a neighbor long before I was born. He was HUGE! 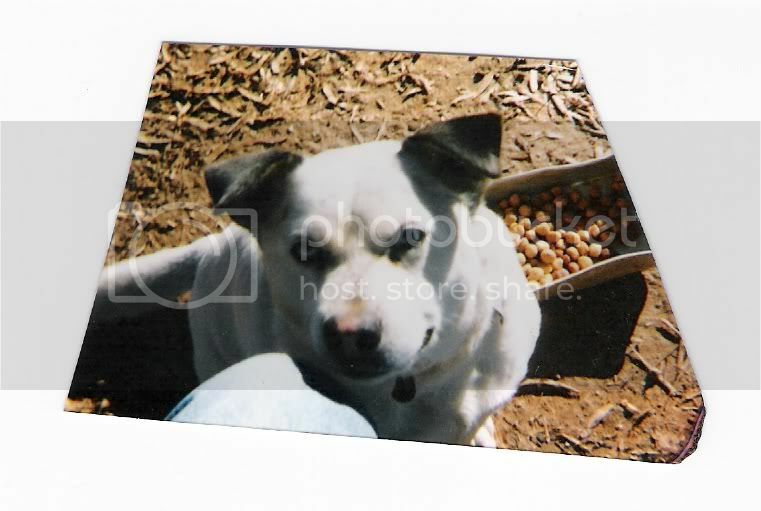 We got Shushu when I was around 5. 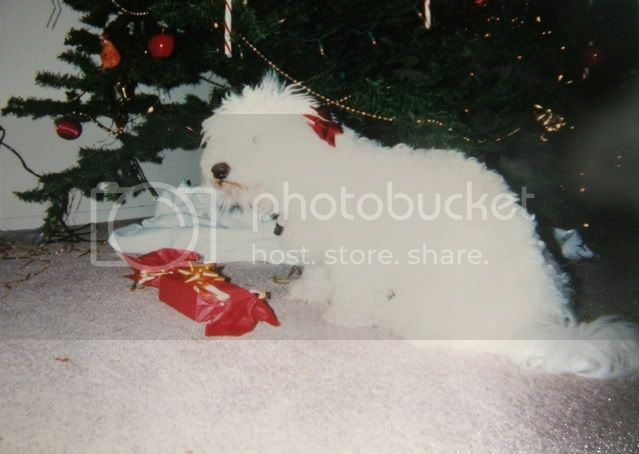 He was an older Bichon Frise puppy, who my Dad's friend gave to us out of nowhere... he was severely abused by her husband, but he was the sweetest little guy. I taught him literally every imaginable trick when I was a little kid, he could even climb ladders. 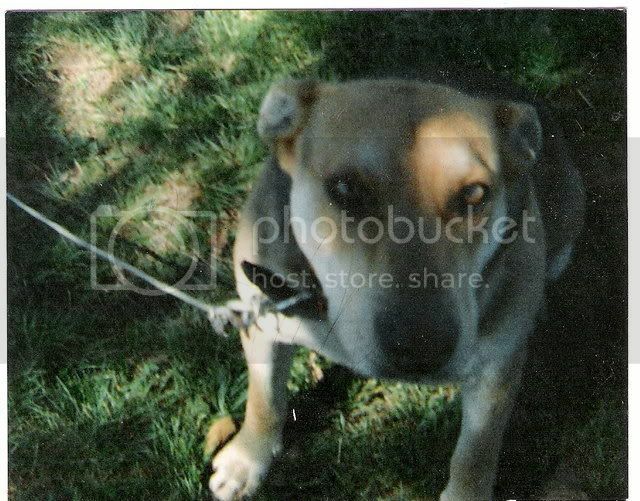 Then, my older sister adopted Penny, a Chi x Beagle mix, from the pound. She was a HUGE troublemaker.